Aberdeen FC’s legal team emerged from the first day of a court battle which could waylay the construction of the Dons’ new £50 million stadium “content” with how proceedings played out. 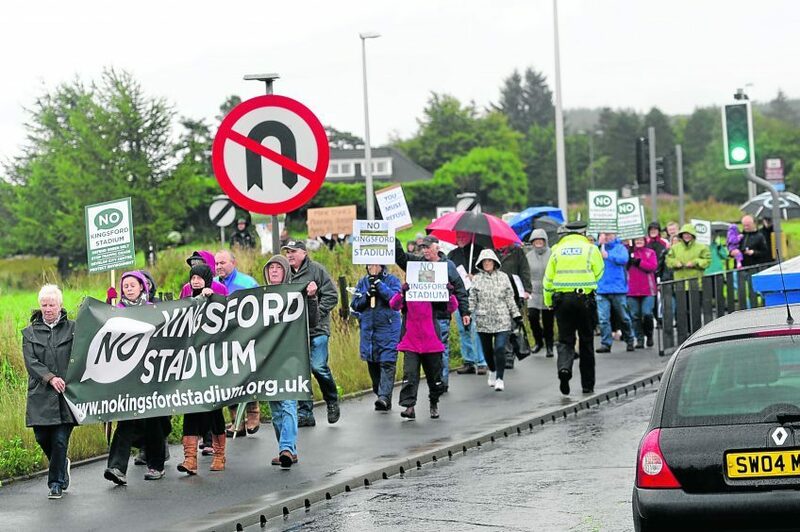 The No Kingsford Stadium protest group has long opposed plans to construct the new 20,000 capacity ground, and training facilities, at a site near Westhill upon which building had been restricted. After Aberdeen City Council endorsed the club’s proposals, the group amassed £66,000 to challenge the decision during a judicial review at the Court of Session in Edinburgh. The three-day hearing got under way yesterday with No Kingsford Stadium’s legal representative, Ailsa Wilson QC, attempting to persuade Lord Tyre that the council’s decision was not lawful. She argued the authority breached several areas of planning policy in recommending that councillors approve the development. The lawyer added the authority did not suitably investigate the possibility of Aberdeen FC basing its new ground at other sites – such as Loirston or King’s Links. And she argued that people in the area expected that the land in question “would be protected from major development” as part of the authority’s own planning framework. The protest group’s case is solely against Aberdeen City Council, rather than the sports club, and Ruth Crawford QC responded for the council by saying planners took a “careful, lawful approach to the development”. She said many of the complaints raised were a matter of “planning judgement” and could not be called into question by the courts. Aberdeen FC has been listed as an “interested party” and club representatives are in attendance at the hearing. James Findlay QC is expected to speak on behalf of the club, and in support of the council, today but as proceedings concluded yesterday he indicated that he was “content” with how the day had progressed. No to Kingsford members attended the hearing but declined to offer any comment “while legal proceedings are ongoing”. Work on the first phase of the project began last year, with site preparations and the creation of access roads, but if the Court of Session finds in favour of No Kingsford Stadium, then the permission handed to the club by the council could be deemed void and the future of the whole scheme thrown into doubt. In that event, the club has previously said it would either resubmit the application or table a new one, taking any guidance from the judicial review into account. Last night a spokeswoman for No Kingsford Stadium said: “The substantive hearing in the judicial review proceedings commenced this morning at the Court of Session in Edinburgh before Lord Tyre. “The court heard submissions from the QCs representing NKSL and Aberdeen City Council, which will continue when the court sits again tomorrow. Lord Tyre is expected to issue his decision in about three months. Aberdeen FC unveiled its vision to flit eight miles from its historic home at Pittodrie and build a new stadium at Kingsford in May 2016. The Dons predicted that such a move could bring huge economic benefits to the north-east, with chairman Stewart Milne describing the site as “ideal” for supporters and hailing its potential to host concerts and other sporting events. 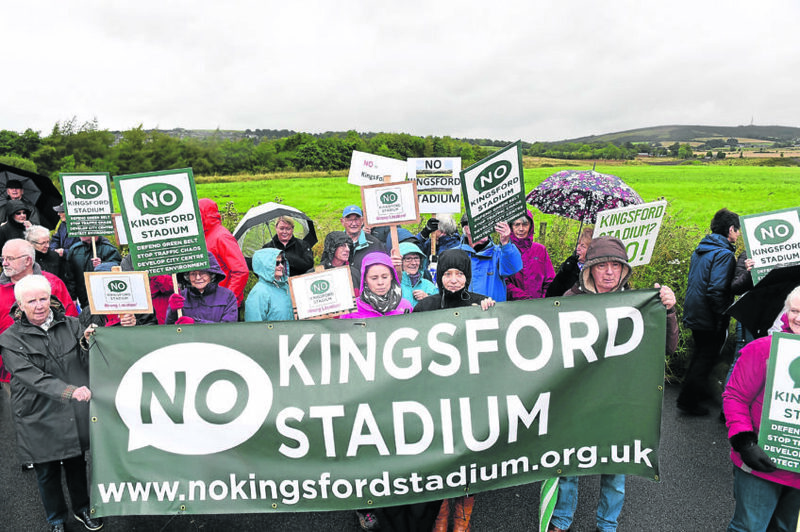 However, scores of people living around the site objected to the proposals and formed the No Kingsford Stadium group. 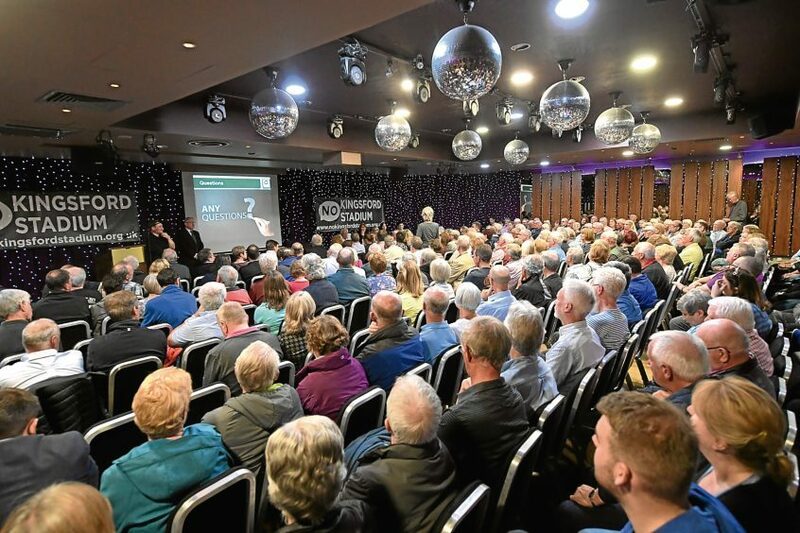 The campaigners raised fears that the new facility could lead to an increase in football violence between rival sets of supporters because it could prove difficult to keep opposing sides apart. They also listed concerns about traffic, air pollution and anti-social behaviour. But locals who back the development later formed their own group and named it Westhill For Kingsford. 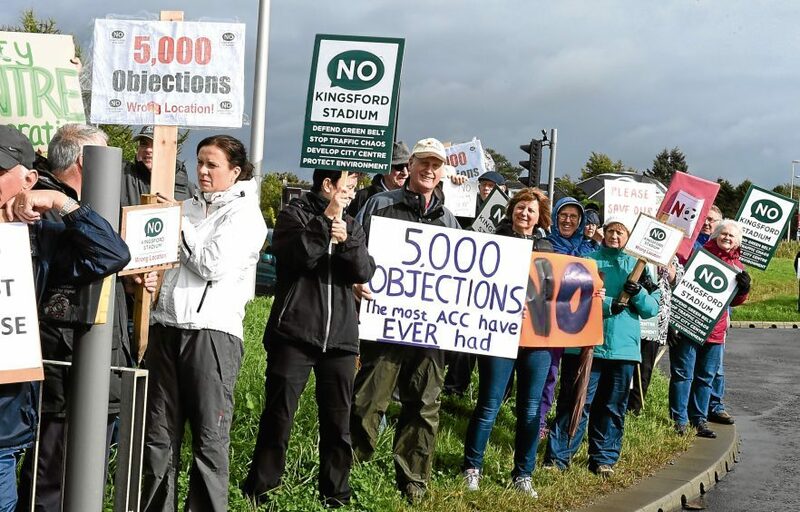 When city councillors carried out a site visit in September 2017, more than 100 people turned out to either protest against the relocation or to voice their support for it. 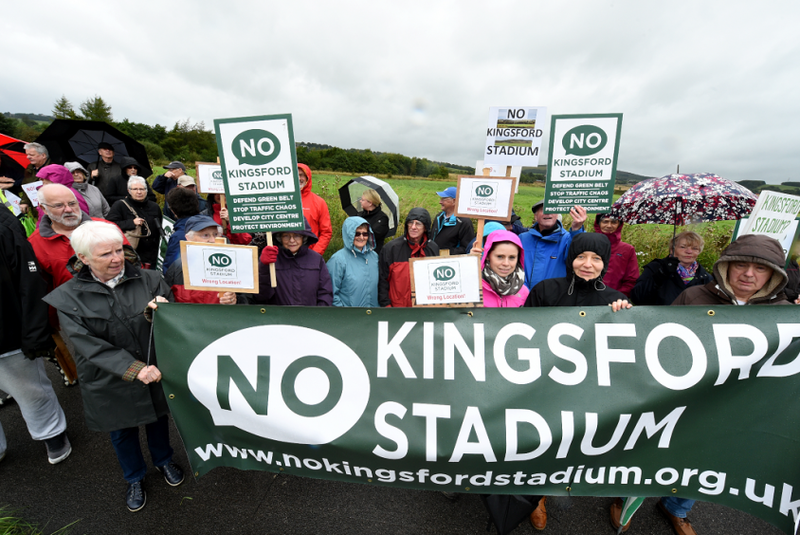 Councillors voted in favour of the plans last April, but two months later the No Kingsford Stadium campaigners confirmed it had sourced the £66,000 required to stage a legal challenge. Aberdeen FC hopes to open a new training complex in June and complete work on the new ground by the start of the 2020-21 season.